1. Preheat oven to 350˚F (180˚C). Lightly grease a 9x13" pan. 2. In a pot on medium heat, melt the butter. Then add the sugar and stir to combine. Continue to heat briefly, just until mixture is hot but not boiling. 3. In a separate bowl, crack the eggs and beat with the cocoa, salt, baking powder, espresso powder, and vanilla until smooth. 4. Add the hot butter/sugar mixture, mixing until well combined. 5. Add flour and chocolate chips, stirring until smooth. 6. Pour batter into the lightly greased pan and bake for 30 minutes, or until cake tester comes out clean (edges should feel set and center should look very moist, but not uncooked). 8. 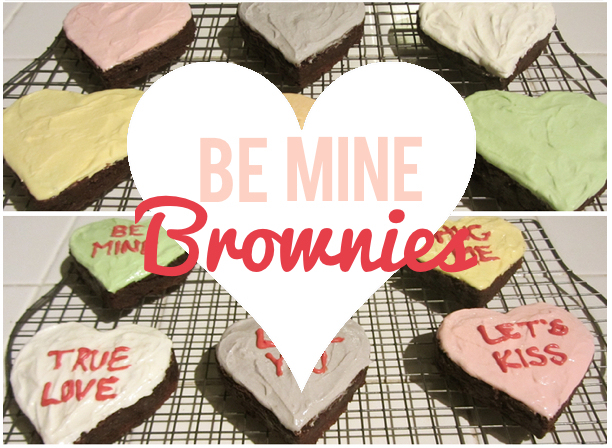 Once cooled, take the heart-shaped cookie cutter and cut out as many hearts in the cooled brownie as you can. 11. Take the red icing writer and write whatever sayings are your favorite from the Conversation Heart Candies. 12. Put on a nice platter and serve to a loved one! Girls Can Rock Bow Ties Too!